These handsome looking cookies take less than an hour to make and taste delicious. I like to fit them into that hour between teatime and bath-time! Mix butter and sugar until completely combined, add vanilla essence, cinnamon and egg yolk. Add sieved flour and mix with hands until dough is formed. Wrap in cling film and put in the fridge for twenty minutes, or until you have done the washing up. Use plain flour to dust the work-top and roll out dough to an even thickness. Use fun shaped cookie cutters makes about thirty medium cookies. Place cut out dough on greaseproof paper on a baking tray and cook on medium heat until the start to very slightly brown. Mix one tablespoon of water with approx 120g icing sugar, or until it coats the back of a spoon. 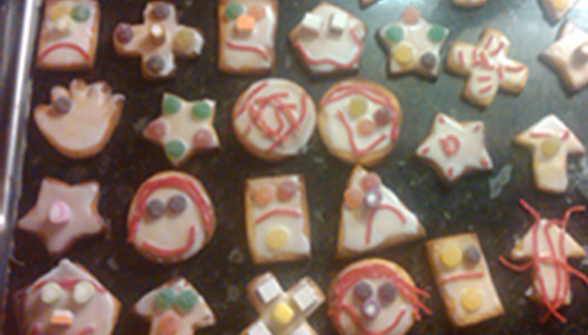 Spread on the cookies then leave the kids to decorate, and prepare for the cleaning operation!